"Great games - great casino"
Kaboo casino is now part of the Gaming Innovation Group – which is one of the most transparent and well managed casino groups – awarded Best Casino Group 2016 by Casinomeister. 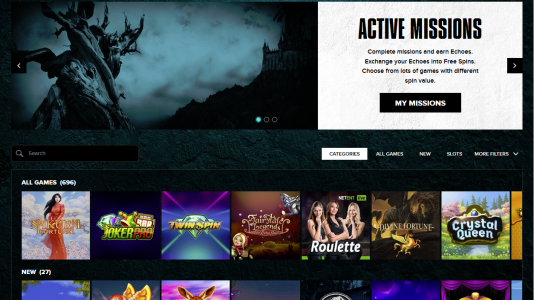 Kaboo casino has a wide variety of games: Betsoft, ELK Studios, Evolution, IGT Interactive, Microgaming, NetEnt, NYX Gaming, Play’n GO, Quickspin, Red Tiger Gaming, Thunderkick, Big Time Gaming and Yggdrasil are its selection base. They are licensed in Malta and in the UK. European facing and currently in our Baptism by Fire section. Credits are the currency of Kaboo and can be exchanged for Spins on games. You’ll win Credits by completing Missions at Kaboo. Every epic journey will have a few Missions to complete along the way and these are ones where the Rewards are worth the effort. This is where all your Rewards will be stored, if you’ve won any Relics or Credits, you can open your Vault and they’ll be waiting for you. Join our Meister Minions and help us gather the info we need to make these payout time accurate. Real payout times from real players. Kaboo Casino Terms and conditions Apply. Kaboo is directly connected to GiG group which can boast of award winning casinos Rizk, Guts, and BetSpin. They are presently going through the Baptism by Fire – so please check them out and give your comments there.